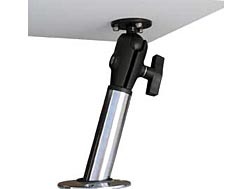 This ingenious self contained pop up table assembly can be installed in any appropriate space you have available on your boat - Maintenance free polypropylene construction make this a must for any size boat ! 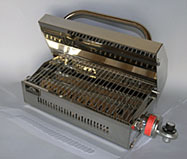 Model SSI-2 $309.00 This stainless steel on board Propane grill (shown left) is equipped with an instant on rail mount for 3/4. 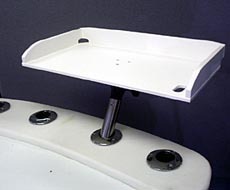 7/8 or 1 inch rails and will also drop into any flush mount rod holder. Its large barbecuing capacity and compact size ( 10 X 19 in.) make the perfect gourmet accessory for any boating picnic. Perfect for those dockside parties and portable enough to carry on board for those gourmet cruises. Our all stainless steel maintenance free grill does not blow out in the wind. Features include a solid teakwood base ( 17in X 17in.) 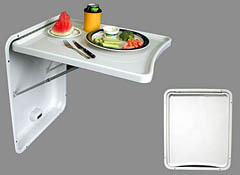 as well as 200 square inches of cooking surface. Propane canister not included. Model No. DBS-1 Shown with stainless 30 inch pedestal $629. Ruggedly constructed utilizing the latest design technology and the finest materials. 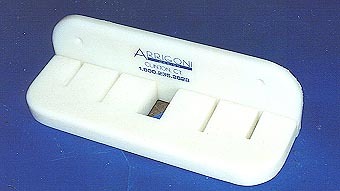 The folding Dock Step is the most versatile, most affordable and most sturdy portable step available anywhere ! 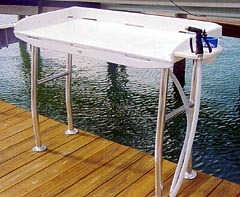 Our extruded aluminum steps feature ribs wit non-skid coverings for sure footed access to your boat. Boat dealers love these steps for boat shows showrooms and for easy boarding of boats displayed anywhere. Turn your rod holder into a elegant food tray for entertaining. Spruce and teakwood custom flag poles. 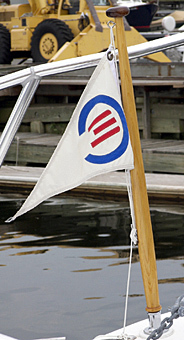 These custom flag staffs are sized exactly to match your boat size. Sockett hardware also available. Please call for special pricing. (solid teakwood staffs are also available). 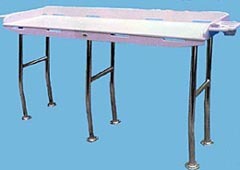 Heavy duty dockside multi-purpose table is to last. Constructed if 100% U.V. inhibited marine grade polymer with all stainless steel fasteners and TIG welded bright anodized aluminum legs. F T72 – $769.00 plus $45.00 shipping.